hayride « AFTER THE POP ! i met with a man today who is struggling with life. he’s been wooed by tina for about 10 years and lost his way home probably a long time ago. feelings of futility, uselessness, frailty, and abandonment seem to be his greek chorus. and their songs return him to inertia with overwhelming regularity. about 4 months ago he began to hurt himself after arguments with a partner. it is a trend that has caused pain and scars in different dimensions and it’s a trait that continues to rear its head. frankly, he has opened my heart. without a doubt, men who overuse meth develop hollow interiors. perhaps it’s like being the remains of a scraped out melon after making classic style melon balls for a cocktail party. what remains is a sticky, runny, meatless shell that is just aching to be filled and seems such a waste. i understand that ache well and i respond to this man’s predicament from my core. as i sat with him, i found myself remembering a time when i had just tested positive for that damn AIDS virus. it was the mid 80’s and there was not much information about what it was and certainly no medication of any kind. there were guys like me all over this country who were struggling with fear and a helplessness. out of la, there was a woman who began working with some of these guys, helping them to regain a bit of their balance and composure. she would infuse their hearts and minds with the idea that our thoughts had power and that we had the ability to have an effect on, my sponsor our own lives. even if the scientists, doctors, and nurses didn’t have that ability. 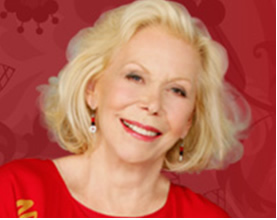 her name was louise hay and she facilitated a weekly group called the hayride and wrote a wondrous small book titled ” you can heal your life”. she not only touched and transformed hundreds of gay men in california, she is credited with sparking a movement in our culture. but i remember her mostly for the profound affect she had on me then and again. strangely enough, 20 years later, i found myself trying to dig myself out of a very dark and dingy hole that my dance with meth had dumped me in. paralyzed with fear, anger, and frustration i turned to 12 step to help me figure a way out because i felt completely bamboozled. in that process i began working with a man who suggested i develop some spiritual practices that would intermittently and consistently keep me connected to a spiritual force. as i worked through this task, i remembered this song and the gift it gave me. i incorporated it into my daily routine again and i have found it reborn in its magic and grace. i know that her voice, her ideas, and her words, comforted me in ways that nothing else could during two very painful and pivotal times in my life. and i still carry some of that ideology within me today. i don’t know if sharing the lyrics to this song she included on her taped affirmations offered my companion any solace, but if it gives him even a fraction of the power it has imparted on my life, then it is a good move. there’s nothing I need to change. the best me I can. it’s easy to love you. And, I love you just the way you are. I judge are done by people just like me. I’ll help it grow by loving everything. And I love myself just the way I am. This entry was posted in addictions, HIV, louise hay, self help. I had the book and the affirmations taped to the bathroom mirror of my apt. on Cornelia & Halstead. Sometimes it helps to refresh/relearn the basics.